Melbourne is a city in which you can find your niche. There’s a vibrant live music scene, arts, sports games, high end cuisine, hole-in-the-wall cocktail bars, and surprises down every alley. There is also a diversity of attractions within a day-trip radius of Melbourne that will keep you busy for weeks. That being said, Melbourne is a great place to base yourself, and it needn’t break your budget. 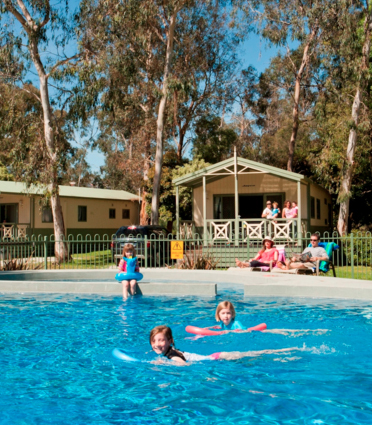 Here are the top three Melbourne caravan parks. They are all mapped at the end of the article. Distance from the centre of Melbourne: 8 km. 10 mins walk from the tram stop. 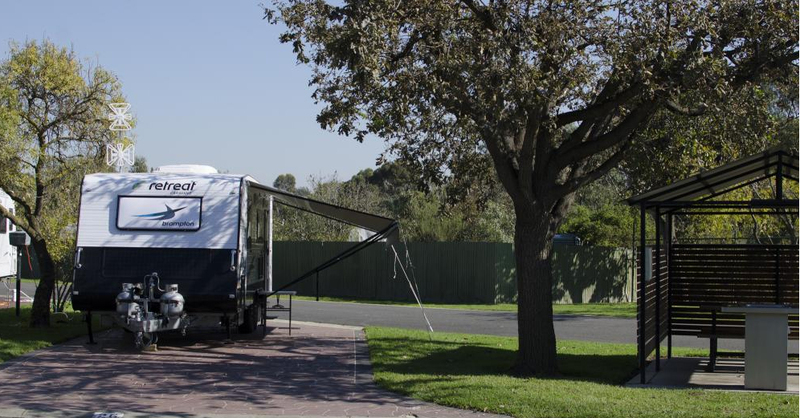 Melbourne BIG4 Holiday Park is the most centrally located caravan park. 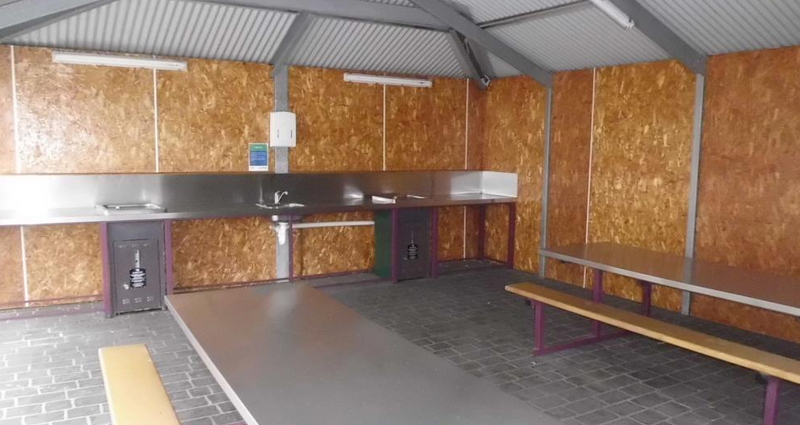 The park has trees and gardens, level concrete sites, ensuite sites, and scores 4.5 stars on Trip Advisor. RATES: From $47 for a powered site for two people. Additional people extra. Distance from the centre of Melbourne: 10 km. 20 mins drive without traffic. Bus stop at park entrance. 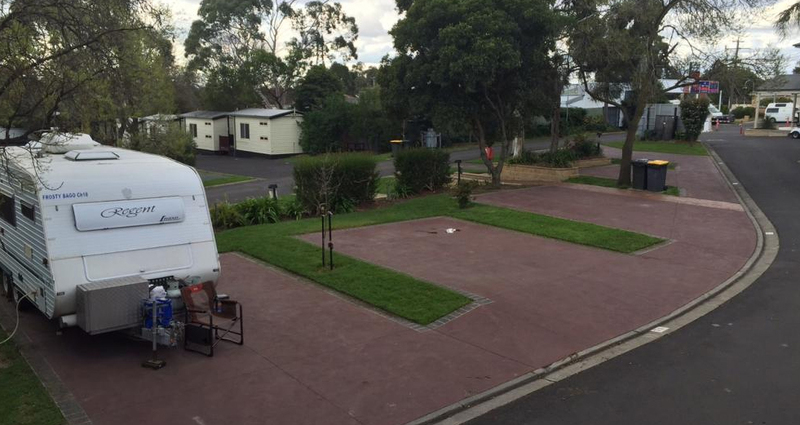 Ashley Gardens Holiday Village is a landscaped caravan park in the middle of a bustling Melbourne neighbourhood. It’s close to shops and restaurants with public transport at the entrance. The sites are a little crowded, but that’s to be expected in a city. It scores 4 stars on Trip Advisor. 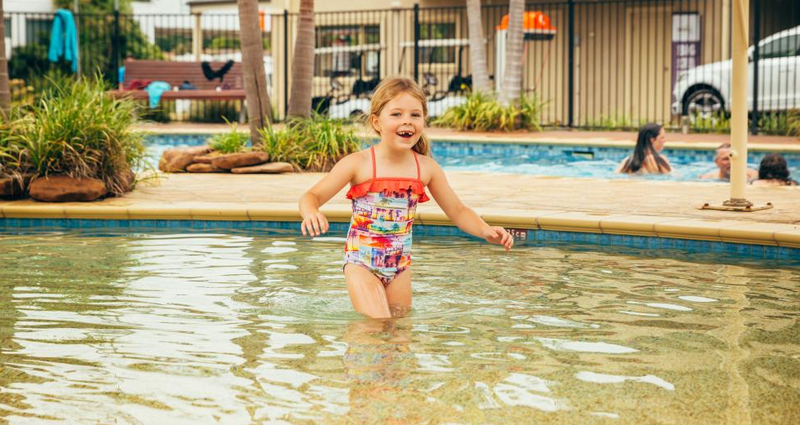 RATES: Deals from $38 for a powered site and up to 6 people if staying for three nights. Distance from the centre of Melbourne: 27 km. 30 mins drive without traffic. Public transport at park gate. 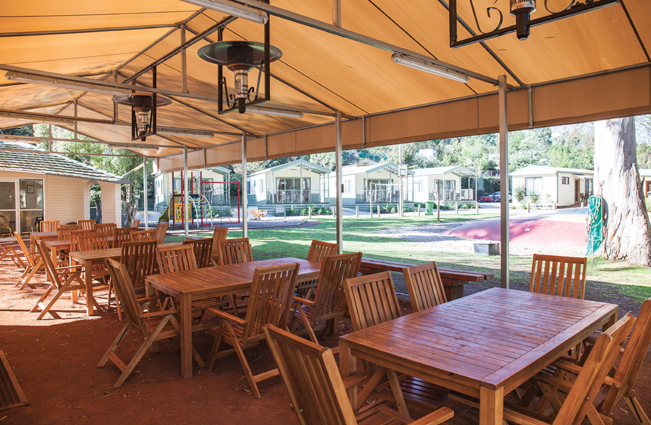 This is a little further out than the others, but it is a beautiful spacious tourist park by a river with quality wooden tables and chairs in the camp kitchen. 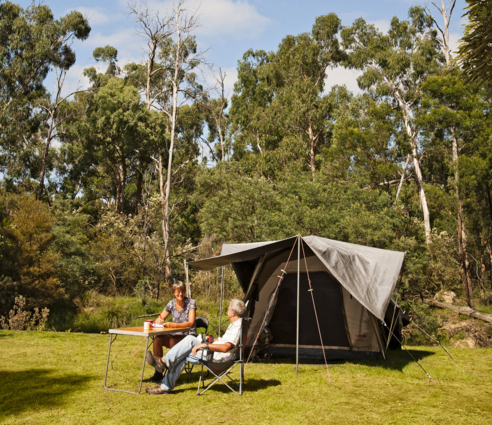 The shaded grassy sites are generously proportioned and surrounded by natural bush and majestic gums and the caretakers appreciate the rich birdlife. 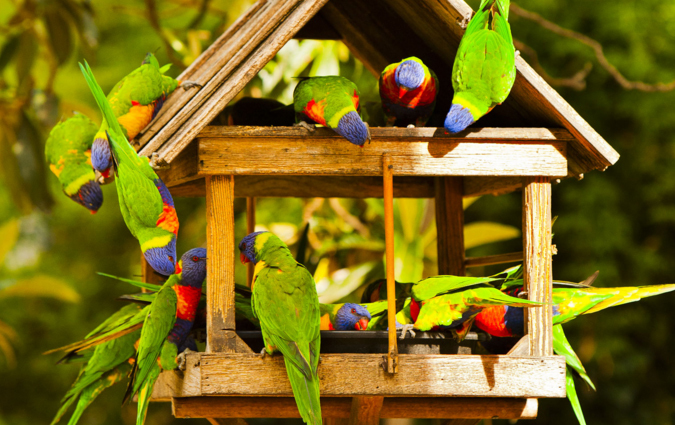 Every morning outside reception you can feed the birds – lorikeets, cockatoos, ducks, and kookaburras that are so friendly they’ll eat right out of your hands. 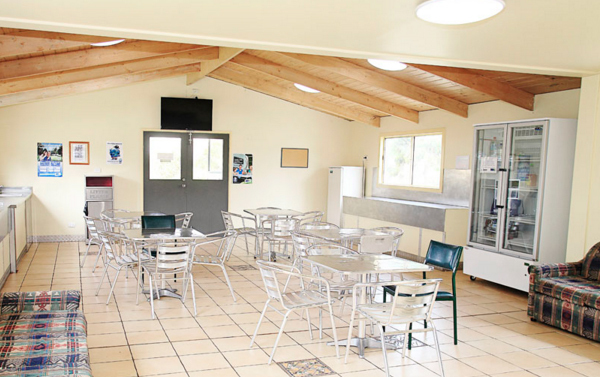 It is a short drive to the Yarra Valley wineries, is near shops and restaurants, and scores 4 stars on Trip Advisor. RATES: $37 for a powered site and up to 6 people. If you’re planning to hire a camper van to explore Australia, I’ve written a blog article that compares the prices of the most popular campervan hire companies in Australia. The start quote is often not what you’ll pay after creeping fees have been added. Great simple post. I just spent a few months camping around Europe, before finally escaping to Melbourne before the Euro winter kicks in. Haven’t tried camping in Melbourne yet though. I hope you had fun camping around Europe, Barry! I did it a long while back when I was a young newbie. What a learning curve! Thanks for your comment! Next Next post: Blue Mountains, Australia: 29 pictures that will make you go WOW!